The Foresters rushed out to an early 5-0 start, this decade's best. The volleyball team shot out to a 5-0 start this season, the program’s best of the decade. Led by lone senior Audry Mallers and solid group of juniors, the Foresters collected their first four wins as host at the Forester Invitational, collecting victories over William Penn, Roosevelt, Robert Morris and Taylor. They knocked off conference foe Grace the next weekend 3-1 at the University of Northern Ohio Silver Spike Tournament. looks to further their record after smash wins over Grace College and Taylor University. 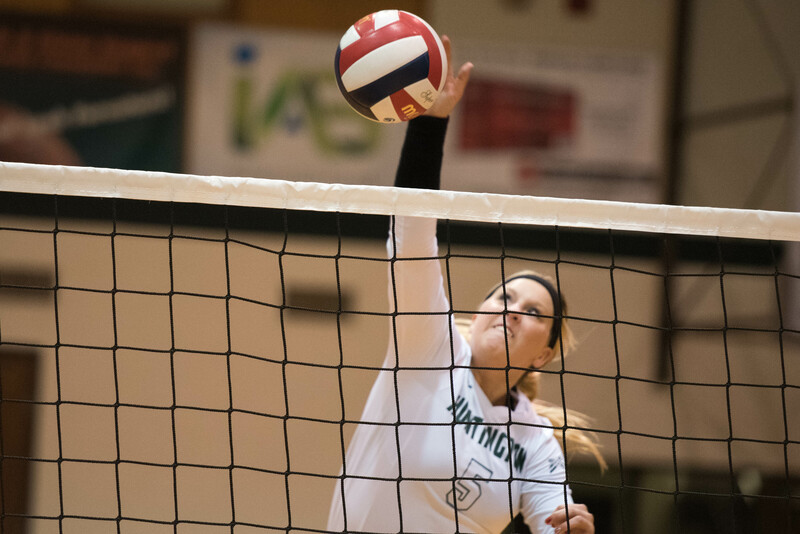 The Foresters gave up just one set to each of their early conference opponents. Coach Kyle Shondell is guiding the team in his second season and is looking to improve upon last year’s 13-15 record. He was particularly proud of his team’s victory over Taylor. “You talk to anybody on this campus, athletics or not, (and) people like when you beat Taylor around here,” he said. Last season’s victory over the Trojans was the first for the Foresters since 2005, so Shodell has now led HU to two straight victories against Taylor. The Forester hit a rough patch following their strong start, dropping their next six straight. After a five-set loss to Bethel Sept. 10, Mallers said she still believes her team has what it takes to finish inside the top two or three in the conference this year. “At the beginning (of conference), we had a little rough start, but for the next game, it will not set us back in our ultimate goal,” she said. Mallers, who plays both front and back row, said everyone on the team has a role, and they each play to the best of their ability in that position—a key to success down the line. The Forester offensive line ran on all cylinders against Bethel, with four—Taylor Schultheis, Josie Beaver, Paige Eakright and Mallers—all coming up with double-digit kills. Kate Cobb dished out 24 digs, while Danielle Gurwell collected two solo blocks and three blocking assists. Another ingredient for a winning season, in the Foresters’ book, is team chemistry and spirit—something they’re far from running out of. Eakright said once her team learns how to “put all of the pieces together,” she knows they’ll find their stride. Mallers and Eakright each tallied eight kills to guide the Foresters offensively in a three-set loss to Goshen. The Foresters will travel to Grace Sept. 23 for a 7:00 p.m. game time.